Winter: skiing in the beautiful area of Ski Civetta, Dolomiti Superski. Spring: cycling, hiking, bike, mountain. Summer: the Dolomites around you. Enjoy them as you like. Autumn: colors that warm your soul. 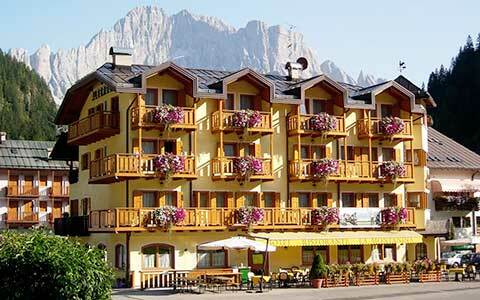 Hotel La Montanina is in Caprile between Civetta Mountain and Marmolada, with wellness. 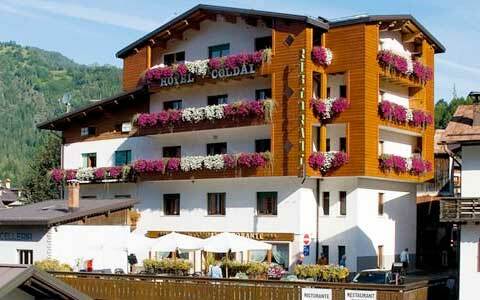 Hotel Coldai is located in the center of Alleghe, 100 meters far from lifts of SkiCivetta. Alleghe is a beautiful village located in the Dolomite Alps of Belluno. Between “Monte Civetta, called by the mountaineers “paradise of the sixth degree ", and the Alleghe’lake, created by a landslide in 1771, it is surrounded by an authentic nature. You can live the summer with walking and cycling and winter with skiing in the beautiful area of the Ski Civetta. Come visit us ! This web-site wants to help you live real emotions in Alleghe one of the most characteristic town of the Dolomites. Here among the most beautiful peaks in the world, the placid lake and unspoiled nature you can stay in a hotel guests of the family De Toni and discover the mountain from every point of view. You see, among these mountains that change color every hour, it will be difficult for you to spend two days in the same way.